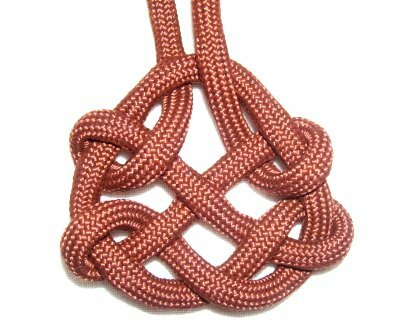 Description: The Pendant Knot features both small and large loops, along with weaving and crossed sections, similar to to the flowing design of many Celtic knots. The ends come out at the top, making it a great decorative knot for Macrame necklace designs. In the example shown, I used Paracord material, which needs to be prepared by melting the ends with a flame. Decorative Fusion Knots is written by J. D. Lenzen. 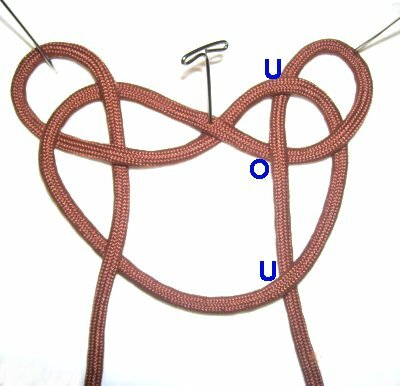 This knot is found on his website, which you can visit by clicking on the link or image. 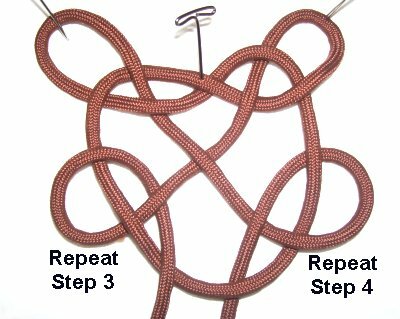 The video gallery contains tutorials for a variety of very interesting decorative knots. 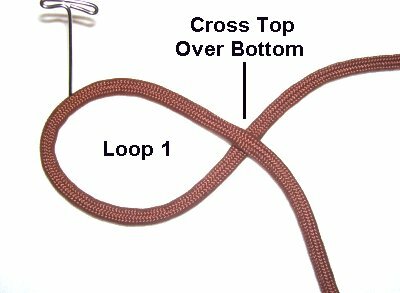 Step 1: Fold a 36-inch cord in half to create the first loop, which is arranged sideways. The top portion should pass over the bottom to make the crossing point, which should be on the right. Step 2: Bring the end at the top around in a counter-clockwise direction, to make the second loop. 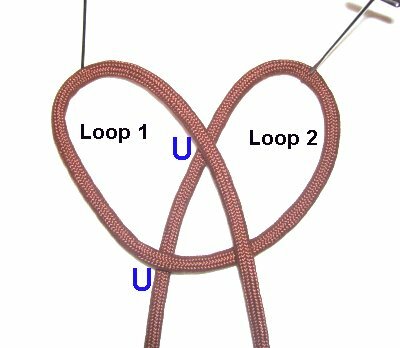 It should be arranged resting under the first loop. 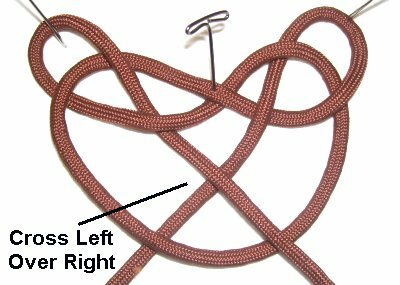 Turn the knot slightly, so it forms a pretzel shape. Step 3: Use the end on the left to make a small loop in a clockwise direction. Pass it over - under - over the three segments in Loop 1 as you bring it down. 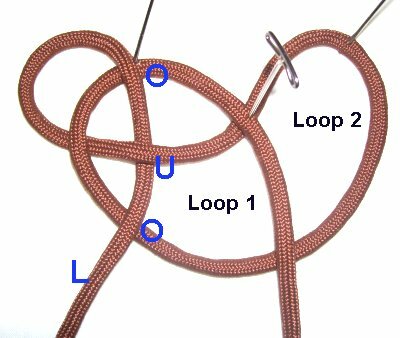 Step 4: Make a counter-clockwise loop with the end on the right. Pass it under - over - under as you bring it down to the bottom of the Pendant knot. Step 5: Cross the ends left over right, inside the knot, near the center. Step 6: Repeat steps 3 and 4, placing two more small loops on each side of the knot, below the others. You can cross the ends one more time and form a third set of loops if you wish to change the design. Step 7: Tighten the knot by removing the slack from the large loop first. Then reduce the size of the small loops. The ends should be at the top, and can now be used to make the necklace design. Have any comments about the Pendant Knot? Contact Me.